I'm Ed Fink, and these are my 360 degree panoramas. 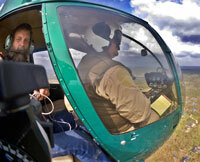 I was the first VR photographer in the world to do fullscreen 360ï¿½ panoramas from a helicopter. Today I'm a FAA licensed drone pilot and shoot most of my aerials with a quadcopter. 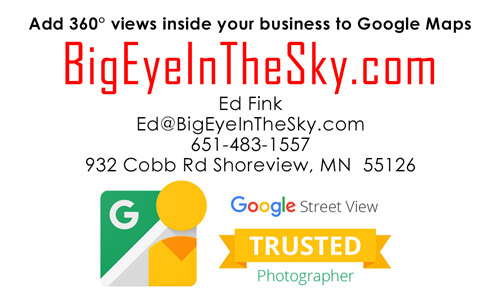 I'm also a Google Street View Trusted Photographer in Minneapolis shooting Street View tours inside local businesses. I publish thousands of 360 degree panoramas and virtual tours to Google Maps, where I currently have over 40 MILLION VIEWS. Take a look below at some of my Google tours, or go to my Google Street View page for more information and many samples. 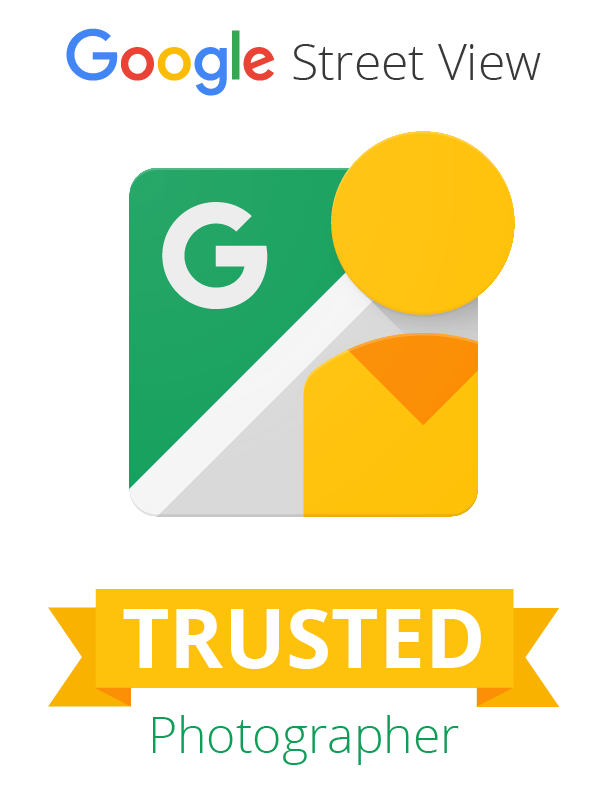 I want to partner with you to offer Google Street View virtual tours to your clients! Google hosts the tour in Google Maps, but you're needed to also embed the tour in your client's web pages, blog, or Facebook. "turning heads and expanding horizons"
I saved all my 2018 updates until it was too cold to fly, and just now finished them! DOZENS of new aerials! 360 degree panorama of the John Beargrease performance/reenactment at the Minnesota History Center in St. Paul, Minnesota. John Beargrease was a legendary Ojibwe mail carrier and fur trader most famous for battling Minnesota’s extreme winters to deliver mail along the North Shore of Lake Superior via dog sled. Using four dogs, he would travel an average of 30-40 miles a day. Today his life is commemorated with the annual John Beargrease Sled Dog Marathon, which is the longest and most challenging sled dog event in the lower 48 states. John Beargrease is one of the many characters from Minnesota’s past that are performed regularly by the Minnesota History Players at the History Center. This was my submission for the 2009 Fall Equinox World Wide Panorama event "Performing Arts". 360 degree panorama in the third floor hallway of the Minnesota History Center in St. Paul, Minnesota. Start with the "Featured" category to see an assortment of my most interesting panoramas. 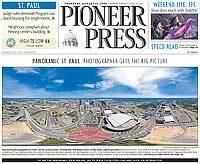 The St. Paul Pioneer Press did a feature story about me. 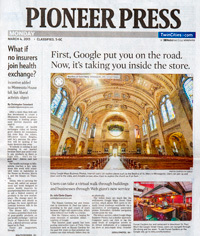 Newspaper article about Google Street View virtual tours, with a photo from my Basilica tour. 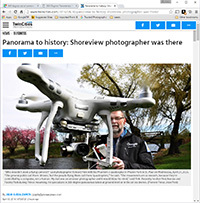 2005 front page feature story about my early aerial panoramas. "That's the coolest thing on the web." "You brought tears to my eyes." "One of the neatest photo sites I've ever seen." "I'm afraid of heights and when I looked straight down I nearly threw up!" "I am stunned by the quality and possible applications, nice job." "That combo of eye-in-the-sky with eyes on the ground is fantastic." "I sent this to every pilot I know." "HOW IS THIS EVEN POSSIBLE?!" "The 360 shots are almost unbelieveable!!!!" "Oh my gosh Ed - they are just beautiful." "That aerial panorama over Lake Calhoun is totally awesome"
"I've instantly become a fan of your panorama photos!" "Wow, your panoramas are like nothing I have ever seen before. Very impressive!" "the absolute best I have seen anywhere." "ED - I am not surprised by all the comments you have received. The VR is AWESOME!" Now I only shoot interactive 360ï¿½ panoramas, but long ago I photographed rock concerts (and almost anything else!) for fun and profit. Here's a few of my concert photos and a story about shooting a 1981 Rolling Stones concert.